Woot! 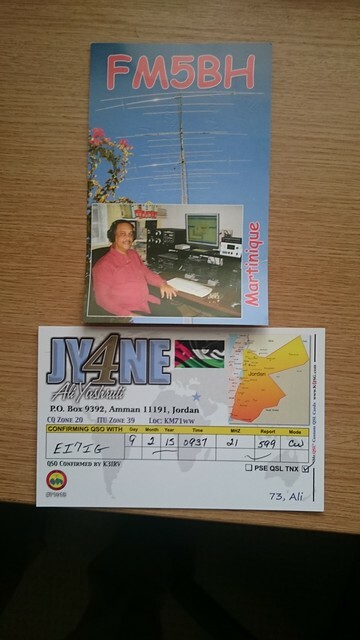 finally, confirmation of DXCC Entities 100 and 101 on the 15m band. Now to get them off to the card checker. Over the last while, I’ve been slowly plugging away at getting 100 confirmed DXCC entities on 15m. Last Friday I was on 89 confirmed on Logbook of the World (LOTW). The International Amateur Radio Union HF Championship was on last wekend, so, after a stint as EI0HQ Saturday evening on behalf of the Irish Radio Transmitters Society, I did some Search & Pounce operating on Sunday morning. Since then the first thing I do when I get home is check the post for any new QSL cards, first thing in the morning I’m checking LOTW to see if any new confirmations have come in. I’m even checking LOTW during the day, just in case (94 confirmed this morning). It has become a bit of an obsession!